While with the MBA in Plymouth for work experience, I was given a chance to help in the facilities wet labs, an area of the building that is kept specifically to maintain experiments and studies that require live species. This may include breeding programs, testing new equipment, behavioural studies, and numerous other useful facets. 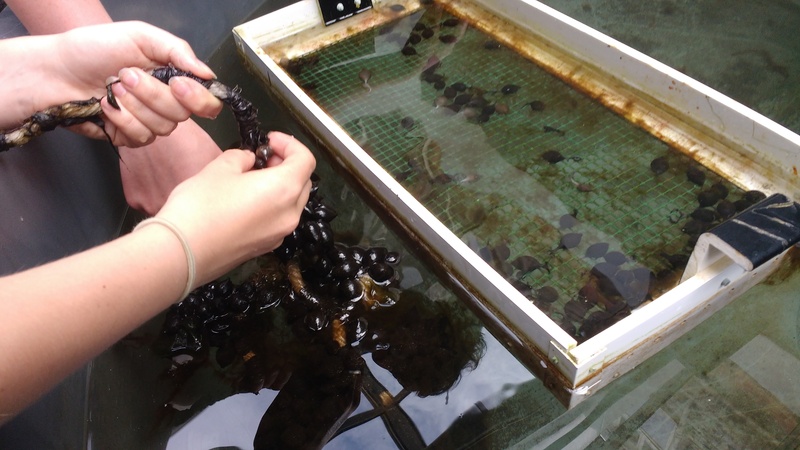 Alix, the lab technician, needed our help moving cuttlefish eggs, bulbous sacs that grow of strips of organic matter like grapes on a vine, to a shallower tank where the baby cuttlefish could be more easily seen and cared for when they hatched. They need these cuttlefish as they are excellent subjects for tests, fairly adaptable and intelligent. 30 or so will be raised into adults each breeding cycle, and the rest will be released back into the ocean. The eggs contain tiny cuttlefish, identical to the adult animal in every way except for size, something which is fairly unusual in marine animals, most of which will go through an extensive larval stage. With a 5:1 male to female cuttlefish ratio, competition between males is high, often ending in confrontations and fights in which they will grapple each other, in an attempt to immobilise the competitor. Larger males will guard the females they have mated with in their dens, waiting for them to lay their eggs so they can find a new mate. Without this protection it is likely that other males would intercept the female and fertilise her, reducing the number of eggs in her brood belonging to the original male. Even with him standing guard, sneakier males can still slip by his defences, hiding their extra arms and changing their body colour in an attempt to disguise themselves as a female. The unsuspecting male lets them into his den, only for what it thought was another mate to fertilise the female and run. Interestingly, it seems that cuttlefish can learn about and adapt to their environment while still in the egg, showing a preference for food sources kept near the unhatched egg. As we began picking the eggs of the rope they had grown on, and into a shallow tray of water, the cuttlefish (which were near ready to hatch) became stimulated by the movement and began to leave their eggs. The tiny animals would bite through the thin protective layer and push backwards out of the egg, using the water jets on the front of their face to propel themselves out into the water, searching for cover. We scooped up the newborns with a small net, placing them in a bucket for safekeeping. Sadly, one of the babies was born deformed, unable to properly float and would be likely to die very quickly in the wild. With a lot of suffering ahead of it, the technicians chose to put it down instead, placing it in a diluted tranquiliser before overdosing it, much like a vet would do to a suffering pet. By the time we had all the eggs, nearly 100 cuttlefish had hatched, and soon we had a tank of them whizzing about the water, hunting mysida shrimp we had caught for them earlier that day. Seeing the baby cuttlefish come in to the world was amazing, as cuttlefish are some of the most intelligent and interesting animals in the ocean, with great social and behavioural capabilities. I really loved working with them, and hope that soon I’ll get a chance to see more cuttlefish up close.